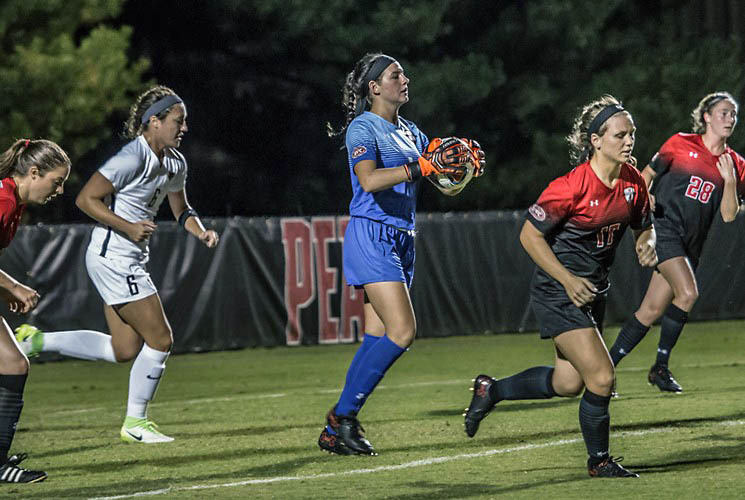 Clarksville, TN – Fighting through the rain and mud, the Austin Peay State University women’s soccer team twice came back from a one-goal deficit collecting a draw against UT Martin, Sunday. The match was moved up due to weather conditions, but that didn’t stop the rain from hounding players during the opening 45 minutes. UT Martin (4-9-3) got off to a quick start, firing off five shots in the first-half. The Austin Peay (7-5-3) defense was busy early, but were able to keep UT Martin from scoring much of the first half. UT Martin opened the scoring in the 33rd minute on a driven shot from Kaci Mitchell that deflected off the keeper’s gloves and into goal. Austin Peay battled in the midfield looking for the equalizer, but the Skyhawks took the lead into halftime. After the break the Govs were more aggressive offensively winning battles in the midfield and pressing higher up the pitch. 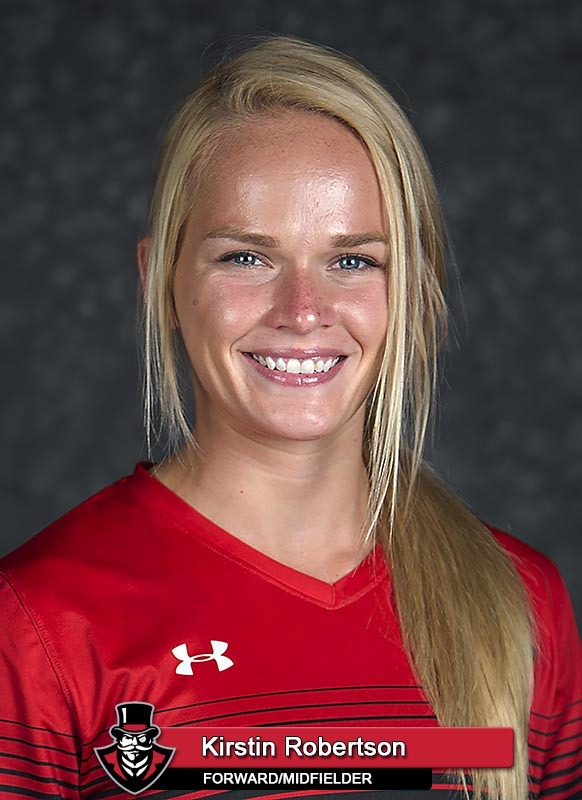 Junior Mckenzie Dixon found the back of the net for the Govs in the 56th minute when senior Kirstin Robertson slotted a ball out wide; where Dixon touched the ball into the 18-yard box and calmly put it away in the far corner. 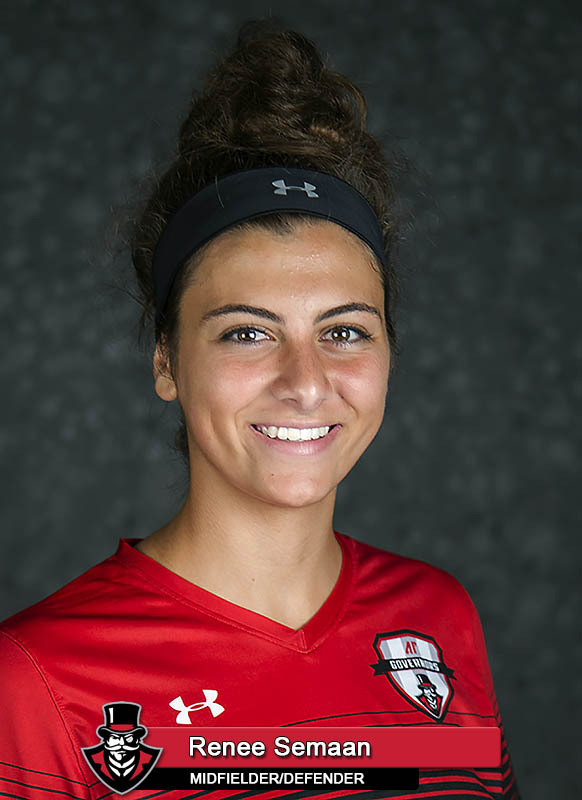 Dixon, playing in her second match back from injury, pulled the Govs equal with her season’s second goal. UT Martin again pulled ahead in the 62 minute on a cross by Katelyn Colvin that was headed into the goal by Danae Kaldaridou. The Govs continued to press high looking for another equalizer. In the 74th minute, the Govs earned a foul just outside the box. The free kick was flicked on by sophomore Renee Semaan and finished by Clarksville’s own, freshman Gybson Roth, for her second goal of the season. The Governors defense was story of the match as the Govs fought off nine corner kicks, with sophomore keeper Mary Parker Powell shining between the pipes; she recorded 13 saves, including a penalty kick save in the 81st minute diving to her left to keep the ball out of the side netting. Powell’s save sent the match to overtime. Overtime was a back-and-forth battle, where both teams had their chances, but neither team found a goal as the match ended in a 2-2 tie. The Governors remain undefeated at Morgan Brother’s Soccer Field winning 6 matches and tying two in Clarksville. The eight game home unbeaten streak is the longest in Govs Soccer history. Powell posted a career-high 13 saves Sunday. Powell’s 13 saves is tied for 10th all time in a single game with Carley Newman (at UT Martin, 10/26/08) and Sarah Broadbent (Centenary, 10/6/02). Sunday’s Warriors: Powell, junior Katie Costantino, sophomore Renee Semaan, freshmen Gybson Roth and Abby Therrell played the entire 110 minutes Friday fending off UT Martin’s 16 shots. The Govs will travel midweek to play Murray State 3:00pm, Thursday at Cutchin Field in Murray, KY.